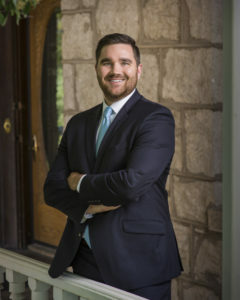 Tim O’Connor has been an associate attorney at Taggart and Professional Background-Tim O’Connor has been an associate attorney at Taggart and Taggart since 2016. After graduating from the University of Nevada, Reno, Mr. O’Connor attended Golden Gate University in San Francisco where he graduated in the top of his class, earning awards in litigation, trial advocacy, criminal law, and academic excellence. During his time in law school, Mr. O’Connor was recognized with the American Bar Association’s Janet D. Steiger Fellowship for his work with the California Department of Justice, was an associate editor for the Golden Gate Law Review and competed on multiple national mock trial teams. Mr. O’Connor was admitted to the State Bar of California in 2015 and the State Bar of Nevada in 2016. Mr. O’Connor focuses his practice in the areas of water law and real property, emphasizing his practice in water rights litigation such as resource development, wetlands preservation, environmental regulations, obtaining water rights, and retention of water rights defense litigation. Additionally, Mr. O’Connor is experienced in municipal law and county development, redevelopment, project permitting and funding, resource planning, and water rights transactions. Mr. O’Connor has served as counsel for municipalities, private companies, publicly traded companies, and individuals in Nevada and California. Mr. O’Connor has appellate experience at district court and Nevada Supreme Court levels. In his practice, Mr. O’Connor advises clients on the various pathways to their goals, including litigation, settlement, and alternative resolutions. Mr. O’Connor began his legal career in the office of the District Attorney for Santa Clara County. Since that time, Mr. O’Connor has worked as both defense counsel and a conflict prosecutor. His interests include helping coach his son’s various sports teams, cooking new foods, exploring the exploding food and beer scene in the Reno Tahoe area, and teaching his son the details of camping and beach-going. In another life, Tim would have been a player scout for the 49ers, and worked his way up in the player acquisition, transaction, and team building aspects of professional football.